And I am back on track! 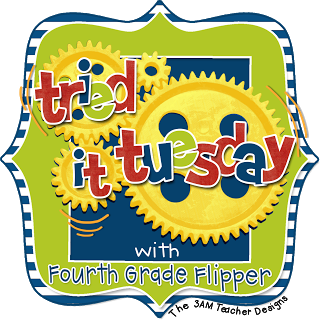 Linking up with my friend Holly at the Fourth Grade Flipper for her weekly linky party two weeks in a row!! Okay, so this is really a "trying" it post as today was our first day but it was BIG fun and hopefully there was some learning too. I got this idea last year from a blog/Pinterest pin and I have no idea who to credit - I can't find it anywhere!! I am also positive I downloaded a file to go with it but can't find that anywhere either. So to the teacher out there that inspired me - thank you and I give you credit. So let's get to the point. The idea is students wear a multiplication fact all day and instead of using people's names you say their fact and their answer. The reason - to hopefully help students recall some of the trickier math facts. I bought these nametags at Business Depot. 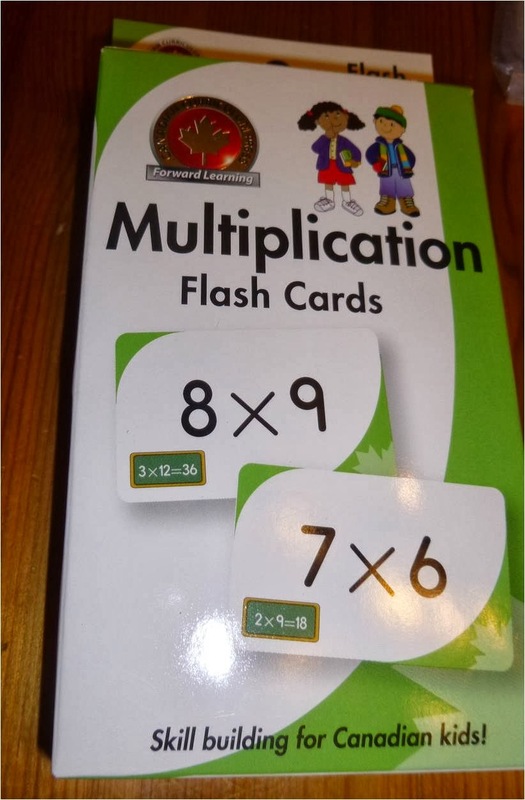 I bought these multiplication cards at Business Depot. Yes I could have made them on the computer or written them with marker but I did not want to make a file (since I was still mad that I could not find the one I KNOW I saved) and did not want to use more ink. Also my writing always starts out neat and well spaced and falls apart after about 5 students. It cost me $20 - but the nametags are totally reusable so I am okay with that. 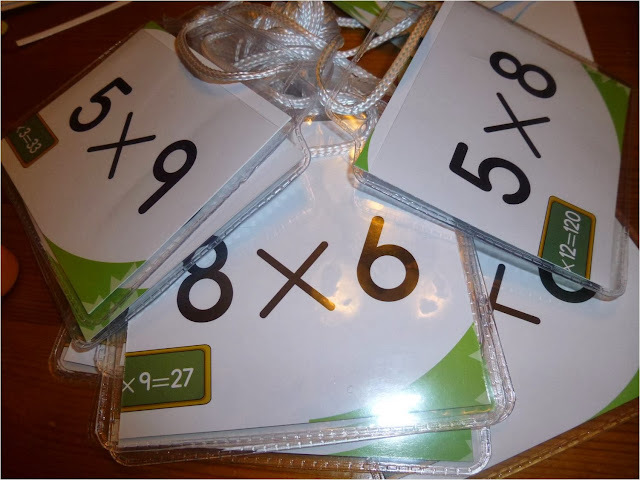 I cut the multiplication cards so they would fit. Today I brought them out and explained to my class what we would be doing. 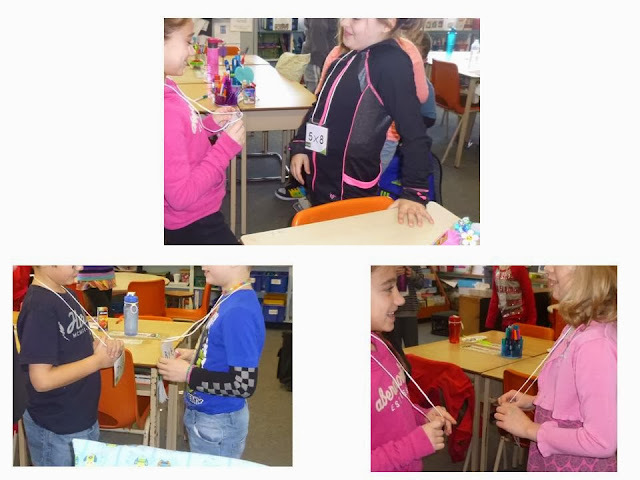 They loved it and had a million questions - what if i don't know the answer, do we have to do it at recess, what about French, can we wear them home. So we all put on a name tag and I gave them time to go around the classroom introducing themselves. Hi my name is 8x8=64 (that was my name today!) and they would introduce themselves and then you would say nice to meet you 7x9=63 and move on to a new partner. My students had to call me 8x8=64 all day, if they didn't and said my name, I ignored them (which made the other kids go crazy with whispering, you didn't do it right, you said her name). I would always reply by saying their multiplication name and the answer to their question. Also at lunch I had our teacher of the day call one student by their multiplication name to get their lunch and then they had to call someone and so on and so on. We did this again before we went to library. At the end of the day they all hung up their nametags and will have new multiplication names tomorrow and for the rest of the week. As their ticket out the door they had to answer the question (I was holding the flashcard) 8x8= and we knew it!! My name was very popular today. I'll keep you posted with how this works for us but so far it a has been loads of fun (and some learning). Congrats to all of you that already know you have a snow day tomorrow. I love this idea! I might have to use it in my class! I am getting hooked on the Tried it Tuesday... I think last week someone posted about "Word Nerds" and I bought the book the same day... still trying to find the time to read it, but am inspired every week! Thanks for sharing! Now this is one of those "Why didn't I think of that?" idea? LOVE IT!! My fifth graders might finally learn 11x12 this way!!! Thank you so much for sharing!! 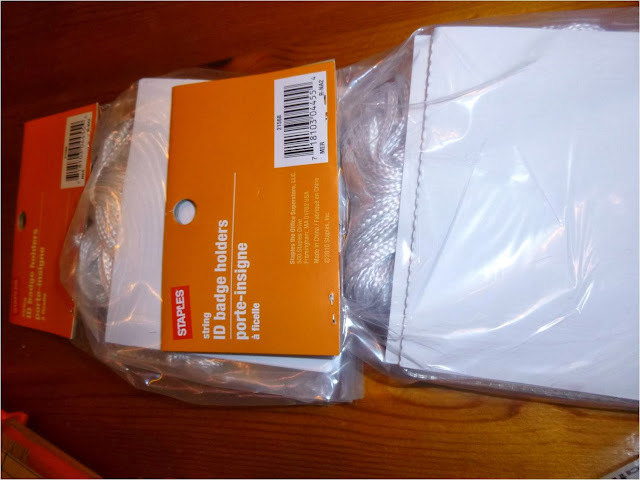 I have also seen that idea on Pinterest (I think with mailing labels), but I LOVE your idea of using the flash cards and the name badges to re-use. I also like the different ways you incorporated using it throughout the day! May have to be a try it I try as well! Ahhh what a totally awesome idea!!! Totally gonna steal this one! Love it! I am going to do this. FUN!!! I would've made my kids do it ALL day too. Recess included! I think I might change my name to 8 x 8=64! It has a great ring to it! I love this! Talk about a trick to remember something that is easily forgotten! Hmmm...I wonder what would be short and sweet to use for ELA? Vocabulary words? Synonyms? Thanks so much for the inspiration as always. Now, I need to find the name tags!